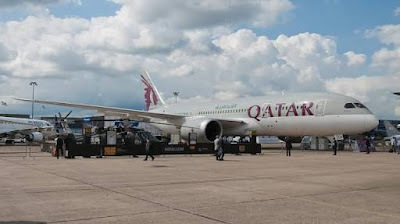 Aviation Updates Philippines - Qatar dropped Cebu, which also enjoys an open skies regime, in Mar-2012. Qatar initially launched services to Cebu in late 2003 as a tag with Singapore, and prior to its suspension the city was served daily with A330-200s. Qatar Airways will resume flights to Cebu with the Boeing 787-8 Dreamliner. Photo by Wikimedia. Doha-Cebu was unprofitable with the A330-200 because of the relatively low yields in the Cebu market but Qatar is confident that the route can be viable with more efficient new-generation aircraft. Mr Akbar said Doha-Cebu will operate initially with the 787-8 and eventually be transitioned to the A350 as more A350s are delivered. A launch date has not yet been set as it hinges on aircraft delivery schedules, but Qatar expects to commence the new Cebu service in 2016. Doha will be Cebu’s third long haul destination after Los Angeles and Dubai, both of which are being launched in Mar-2016. The three new long haul routes as well as new regional routes should drive continued rapid traffic growth at Mactan-Cebu International airport. Mactan-Cebu recorded 20% international passenger traffic growth in 2015, to 2 million passengers. Mactan-Cebu has emerged as an alternative hub to Manila, where congestion limits growth opportunities for Cebu Pacific and PAL. The Cebu Pacific Group is planning to continue expanding its Cebu hub, where it now has more than 20 domestic routes and five regional international routes. The PAL Group currently operates seven domestic routes from Cebu and is now evaluating other potential international routes from Cebu, to supplement its new Los Angeles service and its three existing international routes linking Cebu to North Asia. Cebu is also now served by 12 foreign airlines. While there are huge opportunities for growth at Cebu in terms of local and transit traffic, overcapacity could become a concern, particularly in the international market.